Square Enix is done with simple ports of Final Fantasy 7. Tonight they revealed that the PS4, and later other platforms, will be getting a true HD remake of the PSOne RPG. Long ago, we looked upon a foreboding sky. The memory of the star that threatened all burns eternal in our hearts. In its wake came an age of silence. Yet with each fond remembrance, we knew those encountered were not forgotten, that some day we would see them again. Perhaps it was no more than wishful thinking. But after the long calm, there are the beginnings of a stir. The reunion at hand may bring joy, it may bring fear, but let us embrace whatever it brings. For they are coming back. At last the promise has been made. At the last line, a man with a minigun for an arm and a man wielding an enormous sword come into view - Barret and Cloud. The narrator wasn't talking about the game world - they were talking about us and our wait for an FF7 remake. 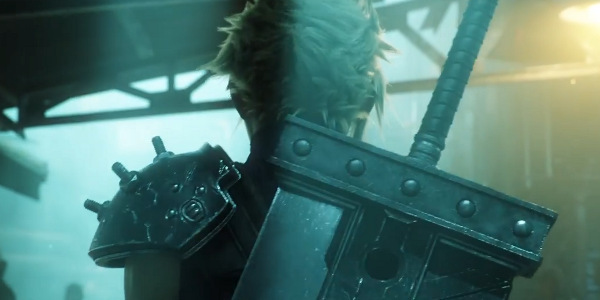 This is a CGI trailer so it's unclear exactly what Final Fantasy 7's remake will look like. I don't think we're going to get visuals on the level of that FF7 animated film but maybe the characters will at least be a little less cartoonish. If nothing else, I'd hope they fix everyone's Popeye arms. Square Enix actually announced the PS4 version of FF7 at PlayStation Experience. At the time, though, they suggested it was just a port of the 2012 PC edition. That re-release featured higher resolutions, achievements and a booster that let players instantly refill their health or gold. However, this trailer makes a point of saying "remake" so it seems the game's getting a more substantial facelift. The developers behind FF7 hinted at a full remake several times in the past. Director Yoshinori Kitase said in one interview that if Square Enix made it, they'd want to make some serious gameplay changes. "If I may speak as a game creator, if we were to produce a remake of VII, for example, I would be really tempted to delete things and add new elements, new systems or whatever because if we were to make exactly the same thing now, it'd be like a repeat." It's been 18 years since FF7's debut on PSOne so there's plenty to update besides the graphics. Maybe we'll see them try to modernize the combat system?